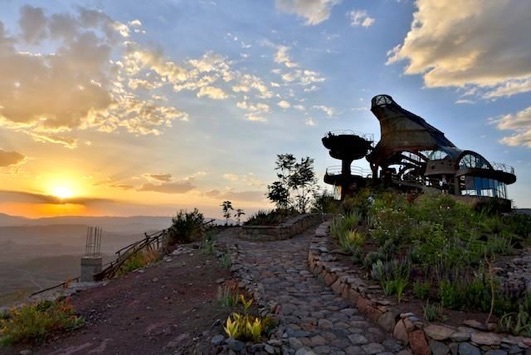 Lalibela is a tourist destination that is growing in popularity as word of the wonderful ancient rock-carved churches spreads. 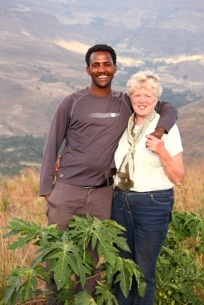 Susan Aitchison, after a long career teaching Home Economics and catering at school and college level in Scotland, has gone into partnership with Lalibelian local Habtamu Baye to create a very special new restaurant on a hill-top overlooking Lalibela. The fresh food is sourced from local farmers and supplies a much needed income to the local economy. Susan has been teaching the staff western style cooking and kitchen hygiene and the three dining areas will offer both Ethiopian and western dishes. Habtamu brings his skills as a local guide and taxi company owner and can arrange transport to the local sights as well as to and from the nearby small airport. It is also possible to watch the baking of local styles of bread in traditional ovens while enjoying a cup of delicious Ethiopian coffee. Ben Abeba is open from 7 am to 10 pm serving refreshing drinks and snacks as well as full meals.